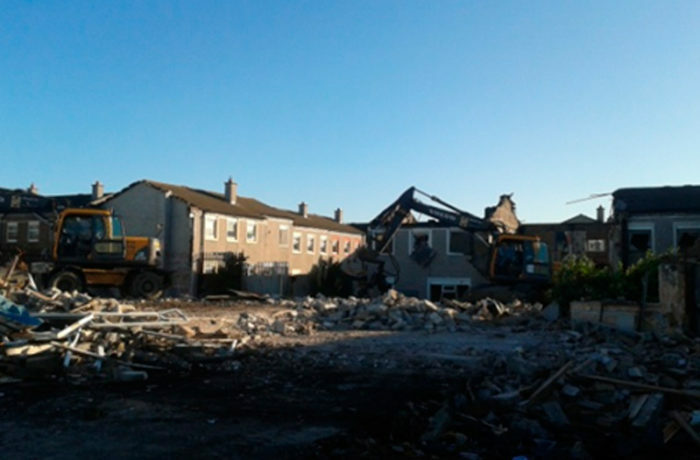 Following a series of anti-social behaviour on site, these works were moved forward to be commenced under the Dangerous Buildings section of Dublin City Council. Erecting a Secure site boundary and provision for a full time Security presence on site. Coordinating and disconnection of all existing site Services to include, Gas, ESB, Water, Telecoms and Broadband. Remove Defunct Drainage, divert and protect existing ESB mini pillars during the demolition works. Draw up as-built Cad drawing of all existing and current services, highlight disconnections and issue to DCC as part of the handover file. To remove Asbestos containing materials (in a poor condition) from the units prior to demolition. Segregation of waste arising’s on site and removal of same on a daily basis to a licensed waste facility. Location of Temporary works supports to areas of structures being retained. Making good of site boundary & footpaths. Importing and spreading of Top Soil over the site and seed to finish. All the above works were carried out in conjunction with Dublin City Council Housing and community groups in order to work closely and safely with the wider community.